You have probably heard of PoW, PoS, and DPoS before but may not have a clear idea of what these meant. With Justin Sun’s recent tweet on the election for super representative, it may add to the confusion. 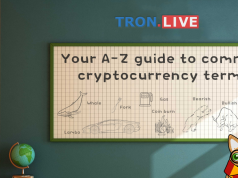 TronLive will attempt to clear this up for you so you can understand what are PoW, PoS, DPoS, consensus mechanism and super representative. Consensus — a fancy word that means “general agreement” is an important component of blockchain technology. Instead of authority for keeping accounts being centralized in a single entity, like a bank or centralized online payment system, cryptocurrency uses distributed ledgers or blockchains to record information. Therefore, a general agreement is needed to record information such as the balance of every address, transactions, etc on the blockchain. All consensus mechanisms aim to secure the network by making it expensive to attack the network and more profitable to help protect it. Few commonly used consensus mechanisms for blockchain are Proof of Work (PoW), Proof of Stake (PoS) and Delegated Proof of Stake (DPoS). Both Bitcoin and Ethereum use PoW as their consensus mechanism. However, developers of Ethereum are working to shift to PoS consensus mechanism because of a couple drawbacks of the PoW mechanism. In Proof of Work (PoW) mechanism, computers in the network (miners) work to solve a cryptographic puzzle repetitively consisting of the mathematical function (hash). Take Bitcoin as an example, the first computer or network of computers (i.e., a mining pool) that found a hash with specific properties are rewarded with few Bitcoins roughly every 10 minutes. This is a proof that they have done the necessary work to verify all transactions in a block as valid and is allowed to add it to the blockchain. Committing a fraudulent transaction on the blockchain will require the party to have over half of the total hashrate of the entire network, this is known as the 51% attack. Since this process requires an immense amount of energy and computational usage, it is extremely hard for a malicious party to attack and make fraudulent transactions on the network. Since PoW is regarded as energy inefficient and not environmentally friendly, along with other disadvantages that make Bitcoin isn’t as decentralized as it should be, newer cryptocurrencies are moving away from PoW consensus mechanism. With PoW, organizations that can afford faster and more powerful processing power usually have a better chance of getting the reward than the others. 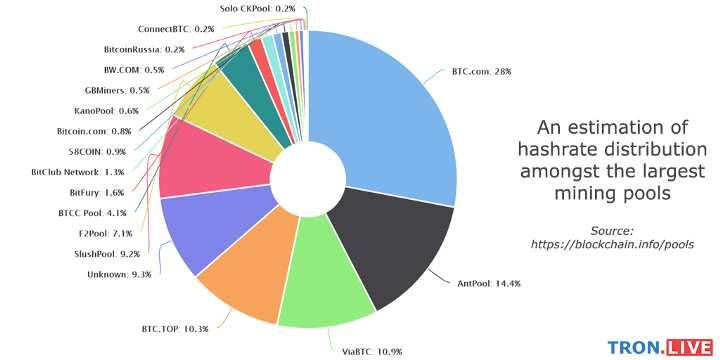 At present, the top 3 bitcoin mining pools (BTC.com, AntPool, and ViaBTC) already accounted for more than 50% of all computational power (hashrate). Proof of Stake (PoS) doesn’t require computers to perform repetitive computations thus being more environmentally friendly. PoS replace miners with validators where they will lock up some of their coins as stake (deposit). A group of validators takes turns proposing and voting on the next block, and the weight of each validator’s vote depends on the size of its stake. When the validators discover a block which they think can be added to the blockchain, they will validate it by placing a bet on it. The validators will get a reward proportionate to their bets. Anyone who holds the blockchain’s base cryptocurrency can become a validator by sending a special type of transaction to lock up their fund. Delegated Proof-of-Stake (DPoS) is a more efficient PoS mechanism. DPoS uses a reputation system and real-time voting to achieve consensus. Community members vote for super representatives to secure their network and super representatives will be rewarded by validating transactions for the next block. 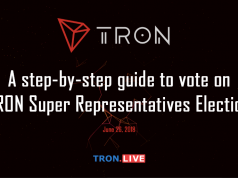 In TRON’s case, on June 26, 2018, there will be an election to choose 27 super representatives with an annual reward pool of 1,009,152,000TRX. 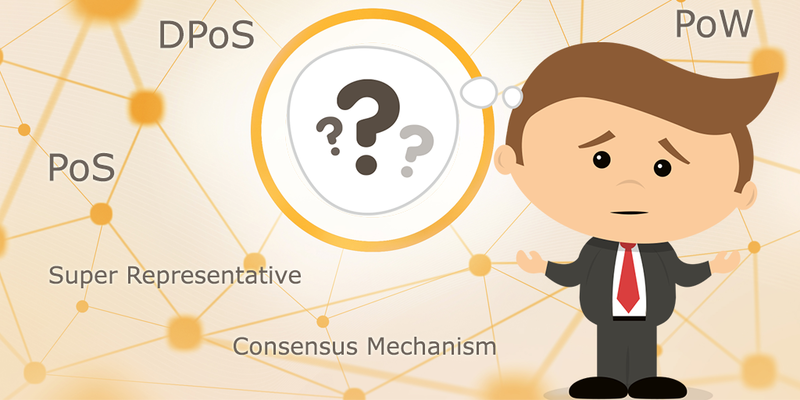 The main difference between DPoS and PoS is in DPoS consensus system, community members have more governance rights in the network. Since the vote in DPoS is always on-going, if a super representative does not behave or perform well, people in the community can remove their votes, essentially firing the bad representative. The super representative must always try their best to obey all rules and keep the network uptime as high as possible otherwise the super representative may be overthrown by its community members. 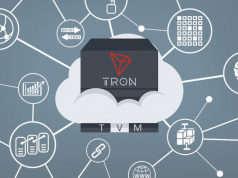 TRON chose DPoS as its consensus mechanism since it is a more decentralized protocol with a democratic, self-governing community, free elections, and overarching legitimacy. That’s all for now! We hope that this guide has helped you understand PoW, PoS, DPoS, consensus mechanism, and super representative better. Previous articleYou can now buy TRON TRX through ATM in U.S.